There are a number of laws governing coach-team communication. First there’s the Law of Diminishing Returns. This is followed closely by the Law of Insignificant Blather which in turn is a corollary to the Law of Self-Important Claptrap. A lesser known but oft broken one is the Law of Volume Discount. The grandaddy of them all is the Law of Relativity. 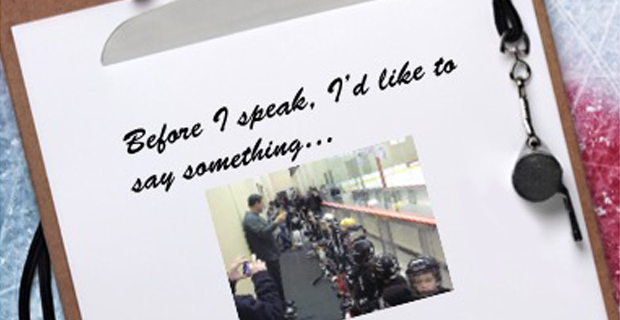 Each of these has found its way into minor hockey coaching mostly because coaches don’t quite seem to get it. To wit this example: In my region there exists a level of hockey called major novice competitive. In other words, eight-year-old travel teams where the best kids from associations play each other. Frankly, it’s a recipe for more problems than proper development, but that’s another story. One recent day, the head coach of a team made a pre-game speech. The group isn’t very strong and is struggling in the standings. On the heels of a practice whose focus was positional play, another slap in the face of development, the coach had this to say before a game. “I have five words for you: Position - Position - Position - Position and Position.” At which he marched out of the room followed by the kids. (They lost the game, by the way). I’m not sure what his aim was, but let’s look at the application of the communication laws. Diminishing Returns - In his defence, his talk was wonderfully brief, under 30 seconds, about the time it takes for an eight-year-old to figure out how to fasten his own helmet. So the coach did well here. Insignificant Blather - The question is, was his statement significant? And then, to whom? Given he’d done some teaching of positional play (rightly or wrongly), his point was sort of relevant. Blather? Um, yes, because eight-year-olds might have mistaken position to refer to their being seated or standing. I rather suspect, too, that the significance of getting the puck was more important. Self-Important Claptrap - He bombed on this one. To any other adult either in the room or hearing about this, he comes across as someone who forgets that, when seated, he’s still taller than his players. Mind you, it's nice how he slipped in some basic mathematics by first predicting he’d say five words and then actually doing it. Volume Discount - While the talk was short enough, why couldn’t he have just said, “I have one word for you: position.” and let it hang there for a moment, then describe it? No, he figured saying it five times would carry greater import. It didn’t. Relativity - If the most important thing before a game for eight year olds is that they play their positions, then they might as well quit hockey at ten because there’ll be nothing more to learn. Coach, whoever you are, get a grip.